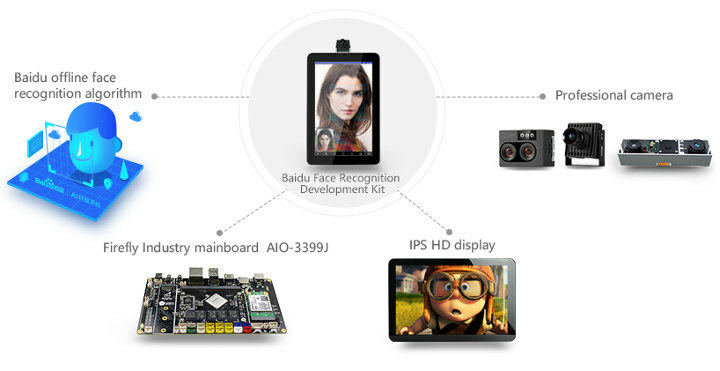 Firefly AIO-3399J industrial board comprised of a Rockchip RK3399 SoM and a baseboard offering plenty of I/O & connectivity options has been bundled with various other accessories including a 10.1″ touchscreen display, and cameras to create a development platform for Baidu AI offline (aka “at the edge”) face recognition technology. 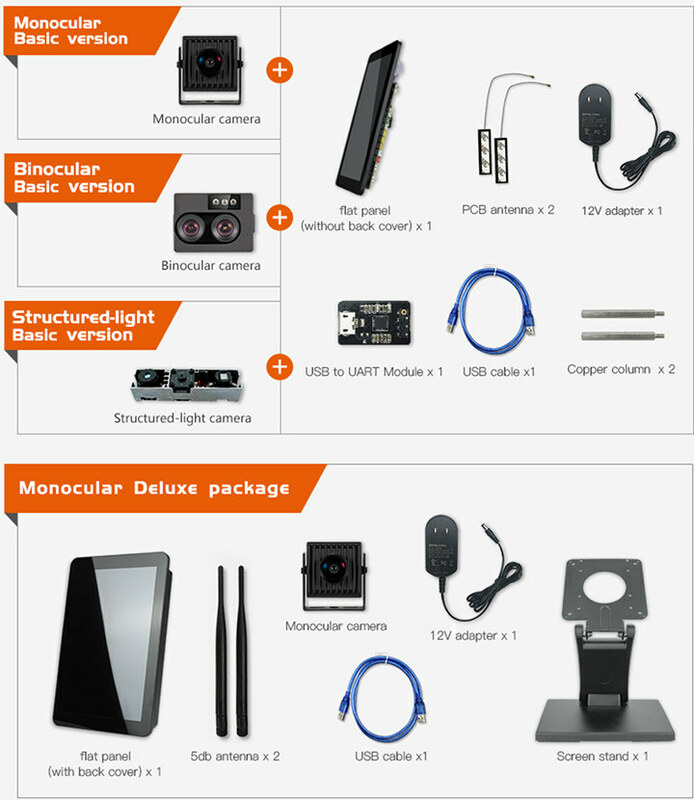 The development kit is available in different variants with either a monocular camera, a binocular camera, or a structured-light camera. There’s also a deluxe kit with WiFi and a stand. Other I/Os – UART, RS232, I2C, ADC, etc.. The development kit supports Android 7.1, and the company mentions an “Open SDK” using an offline algorithm in the product page, but I could not find any, so I asked, and all information you need should be in Baidu’s documentation with the caveat that it is written in Chinese… As a side note a Windows SDK is also available, so if you have your own Windows mini PC/board, you could probably connect a camera to test Baidu SDK out as well. Price starts at $310 for the basic kit with the monocular camera, and goes up to $470 if you use the structured light camera. As mentioned in the introduction, a deluxe kit – available with the monocular camera only – with stand, WiFi antennas, USB cable, and 12V power adapter is offered for $390. Now if you are interested in a face recognition SDK for Android working without the cloud, but don’t feel like learning Chinese language first, it turns out it’s not so easy. While there are plenty of cloud based face recognition APIs from Facebook Face Recognition API, to Amazon Rekognition, or Microsoft Face API, offline support is a bit harder to find. 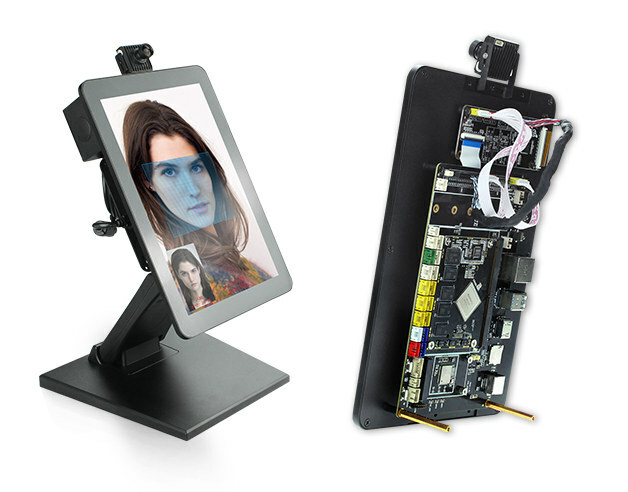 A few commercial solutions like Cognitec FaceVACs or Visage SDK are available, and both of which offer Android SDKs. Baseapp has a list of commercial face recognition APIs and SDKs. If however, you’re after an open source offline solution, it might be worth checking out get-me-through project based on Python 3.x and working on Linux and Mac OS (and maybe Windows). I have not checked the full details, but it probably only works properly (i.e. at a decent speed) on Intel/AMD hardware. Yeah, send your face to a Chinese cloud. What could possibly go wrong? It’s not supposed to work with the cloud, but offline. If you want offline face/object recognition tensorflow with yolo or using inception works very well. Face recognition can be done with tensorflow and facenet, all offline. I’m using it to sort all my photos and make them searchable (I also parse EXIF tags for location, date etc). Added some more info about binocular and structured light cameras, including link to datasheets (in Chinese only).